Drew Rackley – ’16 New Concord John Glenn PG: The 6’1 smooth point guard became the latest member of the famed 2016 Team Work squad to come off the board on Wednesday, as Rackley announced a verbal commitment to Virginia Military Institute, an NCAA D1 program out of the Southern Conference. The Keydets are picking up a capable playmaker with a good handle, scoring ability and really good vision as a both a passer and slasher in transition. 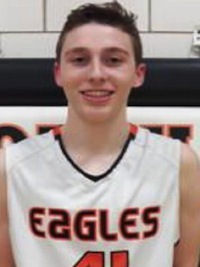 With his toughness and talent, expect for Rackley and teammate Matt Weir to have John Glenn favored to make it to the state final four this season. Quinton Dove – ’16 Euclid PF: We’ve mentioned before that we believe that Dove might be the breakout player of the year among Ohio seniors; well, now we like his chances even more that he doesn’t need to worry about his recruitment while playing his final season. The super athletic 6’6 forward made a verbal commitment to Rider. The New Jersey based Broncos reached into the Cleveland area to scoop up Dove right before the fall signing period, beating out Buffalo and multiple other NCAA D1 schools that were monitoring Dove, as he’s been heavily hyped around the Euclid area since transferring in from Cleveland VASJ this spring. Andy Lucien – ’16 North Olmsted SF/PF: Lucien might still be somewhat raw for a senior wing; but, man, is he athletic! The lanky 6’7 forward has great lift off of two-feet, can make the open three-point shot and still has a lot of potential left in his frame; all reasons why Cleveland State was happy to accept a commitment from Lucien on Tuesday night. Lucien chose CSU over UNC-Asheville and some other low-major NCAA D1 interest, giving the Vikings their latest in-state commitment. Just emerging onto the scene around a year ago, look for Lucien to put up some huge numbers in his final season at North Olmsted.